Superior baking pot for gourmets who want to prepare the best dishes under the bell. 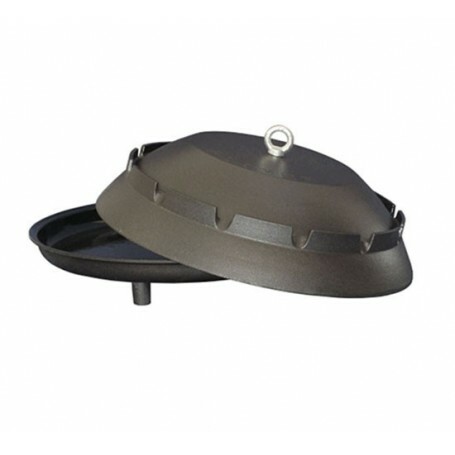 Cast Iron Bell cookware is made of robust natural cast iron, lined inside with food-grade enamel. Cookware comes in two parts, pan and bell with handy holder. Roasting under the bell is a traditional Mediterranean way of preparing food. Fresh young meat and Mediterranean herbs give this dish ancient flavour of distinguished beauty. Food prepared this way has a special flavour and one who was lucky to taste, will never forget this rich natural flavour. Concentrating flavours and aromas under its top, the bell produces exquisitely savoury dishes. This way food is partially roasted and partially cooked. Homemade bread under the bell, as well as lamb and octopus are definitely Mediterranean finest restaurants specialties and now with this high quality dish you can prepare them in your own home on natural way.